Hi there - I got this spanish piggy and I think it's a cotton candy but I wanted to run it by you all because I hadn't seen one with this marking. I've seen the pix of all the variants on mylittlewiki but not this one. What do you think? Yep, that's a Cotton Candy piggy. There were a lot of variations between symbols on the same piggy pony. Many piggies have at least 2 different versions of their symbol, and some even have 3 versions. There were 2 completely separate runs of piggies by 2 different companies which explains some of those differences. Thank you so much. Cotton candy certainly has more than 3 already without this one on http://mylittlewiki.org/wiki/G1_Cotton_Candy#Spanish_Cotton_Candy. Once I get a good pic I'll see if I can have it added there. I wonder btw about a spanish piggy bubbles - mylittlewiki lists that there is one but there's no pic .. I've never seen it referenced anywhere else. Any ideas? Thanks! 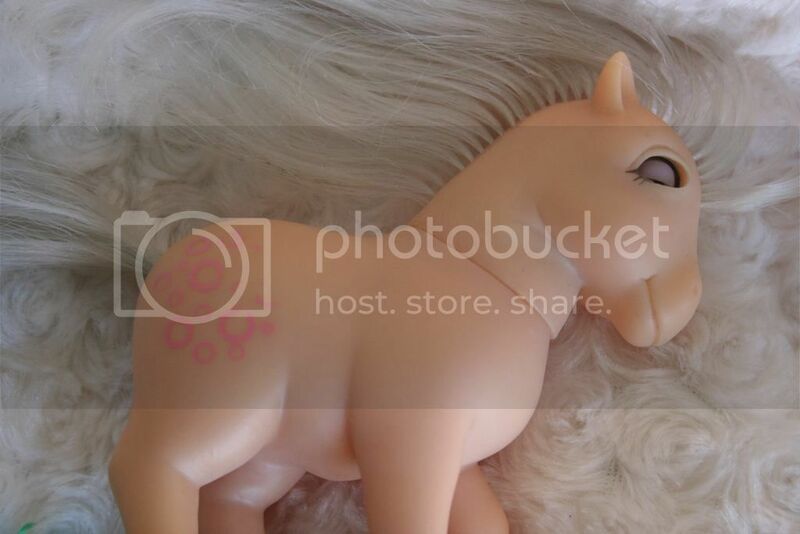 The 3rd pony pictures on the Wiki is not a Cotton Candy variation. 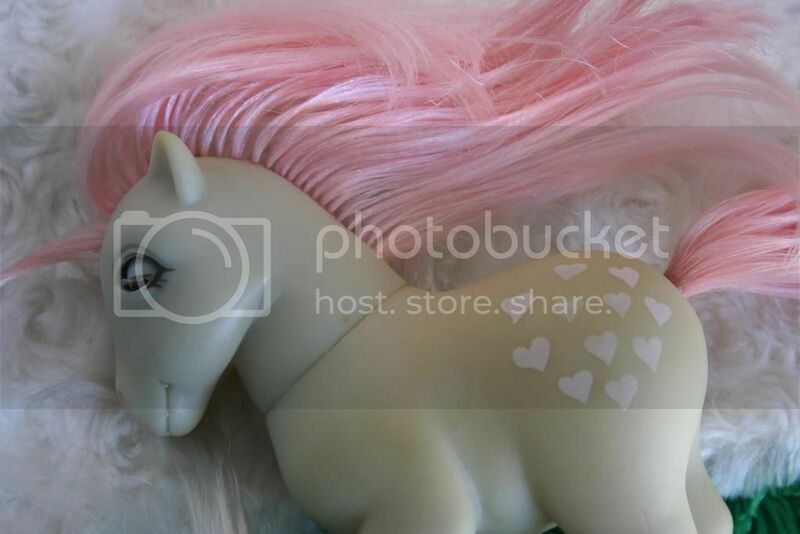 That pony is called Perla and she has a pink body, white hair, and dark pink round circle symbols. Perla alone has 3 different symbol variations. She is sometimes mistakenly called Bubbles because of her symbols, but she has no resemblance to Bubbles and is a unique character, not a variant of a better known character. There is no yellow & blue piggy that looks like Bubbles, either. The Wiki is a decent resource for well-known US, UK, & Europe releases. As far as ponies sold in smaller quantities (exclusives for certain countries, also known as Nirvana ponies) I find the Wiki is not a very reliable source of information and leads to a lot of confusion due to errors like this with Perla shown as a Cotton Candy variant . Oh that is good to know! We can make changes to the wiki I believe, that is the good thing about it. I'll see if I can get on there. So the "cotton candy" perla needs to move with the Perlas. Are those correctly listed under blossom or are they a standalone like Rayito? Sorry for all my questions!! It's nice to find a knowledgeable resource!! And there is no piggy bubbles so that needs to be deleted. I wonder if I might compel strawberryreef to add a section for the piggies. - (need to check name) - pink body, blue hair, pink flowers ...this is not a Blossom variation. She has a unique name on her card. - Fresita - dark pink, white hair, strawberries (I think I spy this beauty in your pictures). There's a Spanish collector who is active on the Arena who owns almost all of the piggies including each symbol variation. She has many of them MOC as well. I'm not sure about editing the Wiki. In the past I donated a few pictures for it, but I never signed up to make edits. That seems potentially dangerous if anyone can make edits & there's no control over who us adding and deleting. It may also explain some if the incorrect info. I don't know of a good site for piggy info. I've picked up what I know from collectors who have first hand knowledge from childhood collections and MOC ponies. I've been interested in pony variations around the world since the early days of the online community, so I try to make notes of useful info when I find it from a reliable source. OK, good to know so Perla is not blossom. I thought that was confusing. And yes .. you did spot a Fresita .. I got very lucky to find one in very good condition. I have most of the common ones .. slowly adding on as I see them appear on the various sites I follow, and I always love it when I see one I haven't seen pix of before, like the one in my last post. You didn't mention it . I hope the thumbnail worked .. that is a blossom no? I am presuming you are referring to Snow? . Long story on mlparena but I prefer to hangout here . For the wiki, it says you can make edits, but you have to log in, and there's no way to register. So I guess that prevents other to edit it. Typically with wikis anything anyone edits can be undone by anyone as well. That's just the nature of wikis. But, as with wikipedia, usually you end up with a useful body of work. I've reached out to the wiki owner and asked for credentials, as well as mentioned the changes that need to be made. Well heck, otherwise we just make our own! The pic you posted is a Blossom. It sounds like you have a nice collection of piggies. Are you in an area where they turn up at flea markets & such or have you purchased them online? I've had 5 Piggies in total (Perla, Minty, Snuzzle, Rayito, & Peachy), but 2 have since found new homes. I think my remaining 3 will be staying in my collection for now. Excellent so it is a blossom, cool. Different than the ones I have. Wow you have a nice collection! if you want to part with any piggies you know who to ping . I have bought mine all online. I wish I'd see them at flea markets, but I never do. Mostly I collect the piggies and CP's, especially if they have cool hair/body color combos . I like restoring really trashy ones, and if they have no hair, even better, I add some cool colors .It's fun. Thanks for your help .. I'll let you know if I hear from the littlewiki on corrections and such. It would be nice to point people to correct information. Oh wow I love her. I love Piggy eyes and I sure hope to own a Piggy one day myself. Yes that is "Cotton Candy", although in Spanish her name is Rosado or Pinky, depending if she is from the first (Brekar) or second (MB) release. I beleive that would be Pinky, from the second release. - Brekar Perla is like Snuzzle, grey body with pink hair and hearts. - MB Perla has at least three variants: She is pink with white hair and her symbols is made by pink spots (lighter or darker) or bubbles (pink hollow rings). 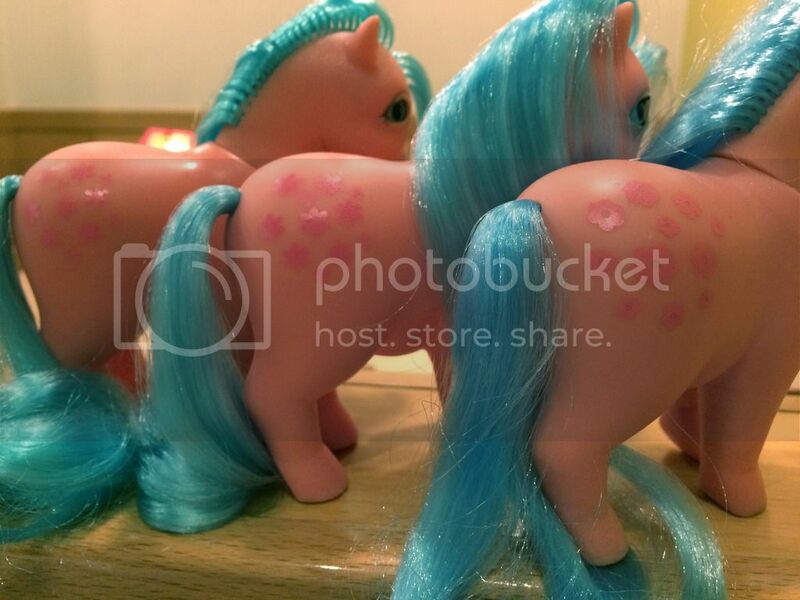 The pony with pink body and blue hair is also called Blossom. In fact, the purple piggy with purple hair and white flowers is called Orquidea. Blossom is from the second set made by MB. She has three variants we know of: Small flowers, bigger flowers and hollow flowers. Mine are the ones on the sides, and the one in the middle belongs to another collector friend of mine. Fresita has three symbol variants and Algodoncete has two. Thanks Lady Pinwheel! That was awhile ago I posted that ... I'll list her tentatively as a Pinky on mylittlewiki. I've been updating the piggy page. Can I use the pictures? Thanks!! Sure! Feel free to use them. I'll try to take better ones, those we made at a caffé. But meanwhile use those just in case I take too long. Oh wow there is so much I candy in this thread. I love that pink one with the white hair. Just gorgeous. Can someone please tell me what a piggy is? Oh my lol thank you for letting me know ! Yikes that thing is creepy!! Hi there! Yeah, I need to add her to MLW. She is a cotton candy.